Whenever I make apple butter, I always think of my brother Brandon. Growing up, I never really liked apple butter, but he loved it. Chris loves it too, and I’ve come around enough to eat my own apple butter, so it’s generally a fall tradition. The thing I like about canning apple butter is that it’s a lot more forgiving than jelly. There’s no critical rush to get it into the jars exactly one minute after you’ve added pectin, in fact you don’t even have to add pectin at all. It’s pretty much like making applesauce then adding sugar, spices, and cooking it way down. You could actually even save time and start with a jar of applesauce if you felt so inclined. I also like that it can be split if you don’t have time to do it all at once (I did the apple sauce stage last night and the rest tonight) and that most of it doesn’t require more than a stir every 10 minutes or so which means, though the recipe takes a long time from start to finish, it’s not really time you’ll be chained to the stove. Basically, this is an easy fruit spread with a big bang…especially when packaged in adorable mini 4oz jars just perfect for giving away. 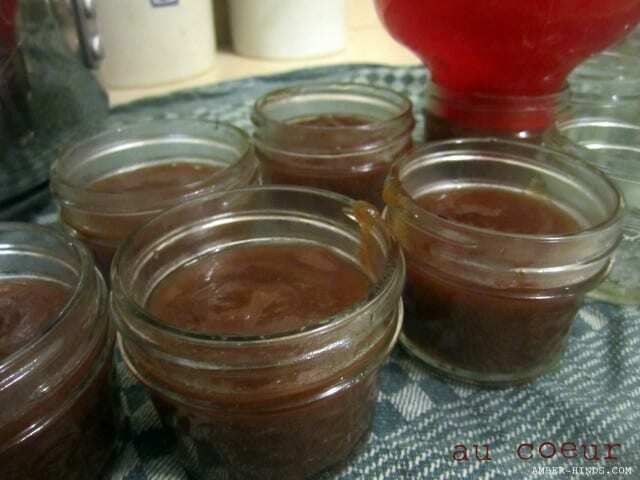 This recipe makes about 10 cups (8oz) of apple butter (may differ slightly depending upon how you core your apples). It takes approximately 3 hours from start to finish. Important! Please read this post about canning basics first!! Return apple sauce to the pot. Stir in sugar, cinnamon, cloves, and allspice. Bring to boiling; reduce heat. Cook, uncovered, over very low heat 1 1/2 hours or until a very thick mixture mounds on a spoon, stirring occasionally. Meanwhile, prepare canning jars and hot water bath following steps found here. Ladle hot apple butter into hot, sterilized jars, leaving 1/4 inch headspace. Wipe jar rims; put on lids and hand tighten metal bands. Process in a boiling water canner for 5 minutes (begin timing when water returns to a boil). Remove jars and cool on racks. My family has been making applebutter for over 40 years. May I suggest reducing (by cooking) the cider by half then adding the apples? Depending on the apples, this should eliminate the need for granulated sugar completely. I’ll have to try that Jane! I’m all for reducing sugar where possible. Do you know how it holds up to canning? I’m usually hesitent to reduce sugar in recipes that I’m going to water bath can since it acts as a preservative.